Enjoy a stroll on the beach with Love Island Instant Cash by IWG! It is available at Wicked Jackpots. It is reminiscent of the 2015 British reality show called Love Island. The game’s backdrop shows a lovely beach with fine sand on a sunny day. Plus, it is packed with 3 games and a Bonus round. Get the chance to earn up to £250,000! This original game is playable on any kind of device at Wicked Jackpots! 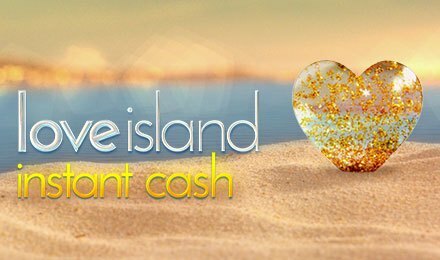 Join the fun on Love Island Instant Cash by adjusting your stake. Once done, hit the Spin button to begin. Simply match 3 or more symbols on their respective lines to win. You also have the possibility to reveal the prizes one at a time or speed things up by clicking on “Reveal All”. Bet Levels: Betting levels are absent. Amount of Paylines Selection: No paylines are available as it is an instant-win game. Coin Values: The stakes vary from £1 to £5. Love Island Instant Cash consists of a Bonus round during which you simply must spin the Bonus Wheel to trigger the prize on which it stops. Game 1 consists of different symbols such as diamonds, hashtags, stars, gold bars, slippers and mobile phones. Match 2 of them in a column to earn the prize shown. The different payouts can be £1, £5, £30 or £10,000. Several values are displayed during Game 2 on Love Island Instant Cash. They are £1, £2, £10, £25 or £100. Match 3 of them to trigger a prize. Symbols like mobile phones, stacks of cash, gold bars or lips are displayed during Game 3. Your goal is to reveal a Lucky symbol and win. Land the Lucky Wheel symbol to trigger the Bonus game. Enjoy an original gameplay anytime on Love Island Instant Cash on Wicked Jackpots where lots of fun await. Wish you all the best!